TRIPOLI/MOSCOW (Reuters) - Russia's embassy in the Libyan capital of Tripoli came under fire on Wednesday and a group of people tried to force their way into the compound, the Russian Foreign Ministry said. Diplomatic sources in Libya said security guards fired shots to disperse a group of about 60 people that had approached the embassy. An attempt to enter the building was repelled and according to the Foreign Ministry no diplomats were wounded. "The attackers opened fire and tore the Russian flag," the Russian Itar Tass news agency cited unnamed sources as saying. Embassy staff had been taken to the airport as a precaution. Russian Foreign Ministry spokesman Alexander Lukashevich told Russian state television the situation had calmed. "In Tripoli ...a shooting occurred and there was an attempt to enter the territory of the Russian embassy." The attack was symptomatic of volatility in Libya two years after the overthrow of Muammar Gaddafi. Clan and tribal rivalries, as well as Islamist groups, have flourished in the absence of strong central government. Security services, themselves riven, have struggled to maintain order. There have been a number of attacks on Western diplomats by militant groups. Militants linked to al Qaeda affiliates attacked the U.S. consulate in Benghazi and killed Ambassador Christopher Stevens and three other Americans on September 11, 2012. However, one Libyan security source said the attack did not appear to be directly linked to any militant group. He said the crowd were angered by the killing, as they saw it, of a Libyan by a Russian woman. 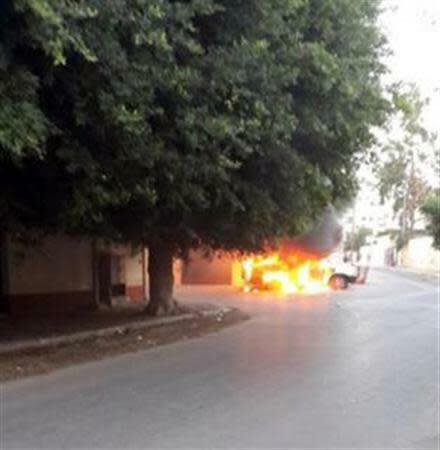 "The group attacked the compound as an act of revenge, because of the killing of the Libyan," said the security source. The embassy was empty at the time. Western powers, using air power, led the military campaign that ultimately toppled Gaddafi. Russia, which had had close relations with Gaddafi, did not take part in the action and condemned what it called the West's abuse of a United Nations Security Council to intervene.